Esplanade: a level, open area; especially an area for walking or driving along a shore. The reason for the name becomes obvious as you stroll along the northwestern bank of the Cave Creek Wash as it crosses the Sonoran Preserve. 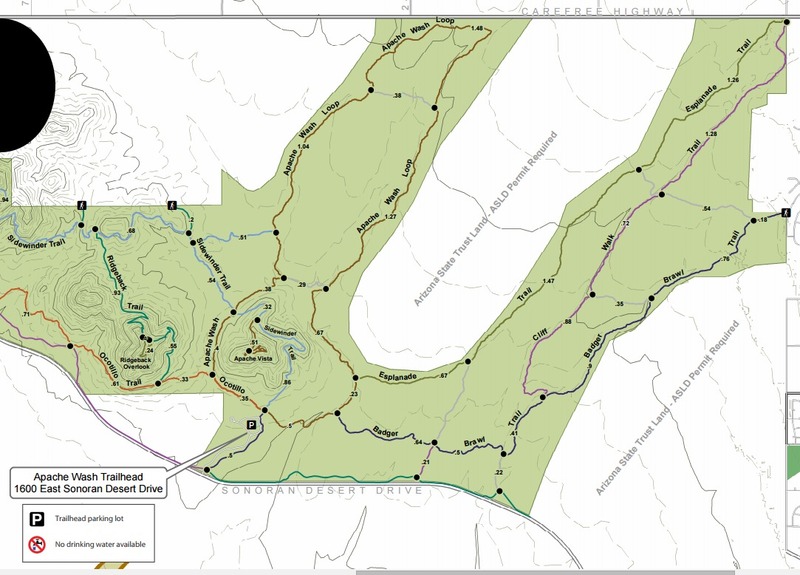 The trail only gains 127 feet from it's southwestern intersection with the Apache Wash Trail and its terminus at the Carefree Highway. The gain is so gradual as to be imperceptible. 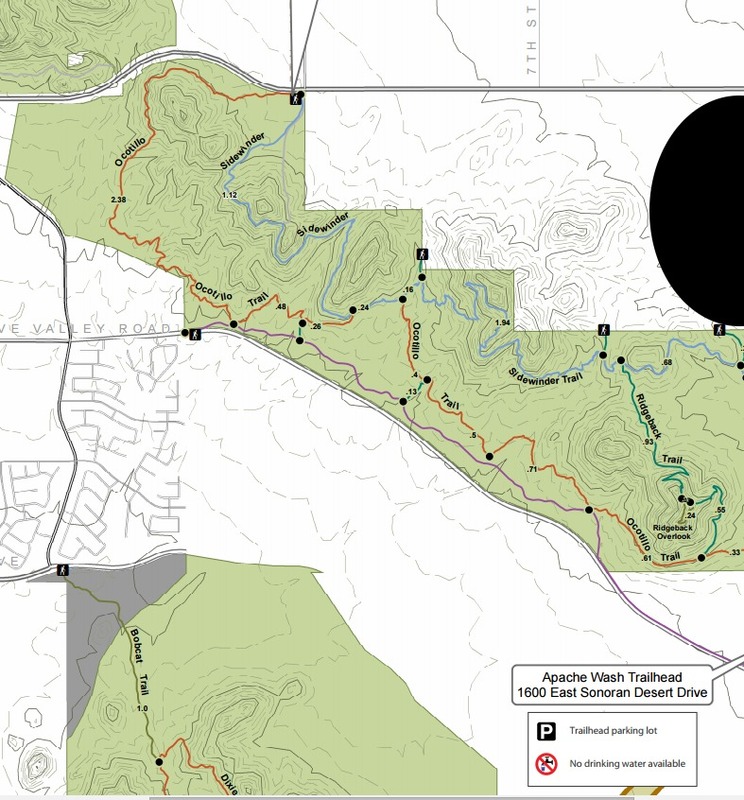 This description assumes you hike the trail southwest to northeast. Park at the Skunk Creek Trailhead off of Dove Valley/Sonoran Desert Parkway. While the Skunk Creek Trailhead has very nice bathrooms, it doesn't have potable water. You've been warned. Head northeast along the well marked Apache Wash Trail. The Esplanade branches off to the right (ENE) approximately .8 miles into your hike. The intersection is well signed. The Sonoran Preserve used one or two letter identifiers for each of the trails. The Esplanade is designated with an E. How creative! The first section of the Esplanade is flat and sparse, very unlike the verdant section of the Apache Wash Trail you just left behind. It is the flat desert of brittle brush, creosote, prickly pear and buckhorn cholla with a few scattered saguaro that dominates the Sonoran Desert at this elevation. Look straight ahead you'll see Black Mountain. Before long you'll cross and old fence line. This area was once grazed. You cross a small drainage with a few ironwood and palo verde trees. After crossing an old jeep trail, you'll begin to parallel the Cave Creek Wash and the hike gets more interesting. On your left is a continuation of the desert you just hiked through, but on your right is a nice tangle of ironwood, palo verde, various shrubs and often a nice grove of saguaros along the edge of the wash. The wash is very wide here. Across the wash you can see where floods have cut into the slightly higher terrain leaving some nice cliffs. A powerline appears and cuts across the trail. A sign marks a connecting trail across the wash to the Cliffwalk Trail. Soon you will hear traffic noise from the Carefree Highway just north of you. The trail joins and old jeep trail. When you see the bridge across the wash you know you are nearing the end of the trail. There is a turnout for east bound Carefree Highway traffic just before the bridge offering limited parking and an alternate access point for the Esplanade Trail. 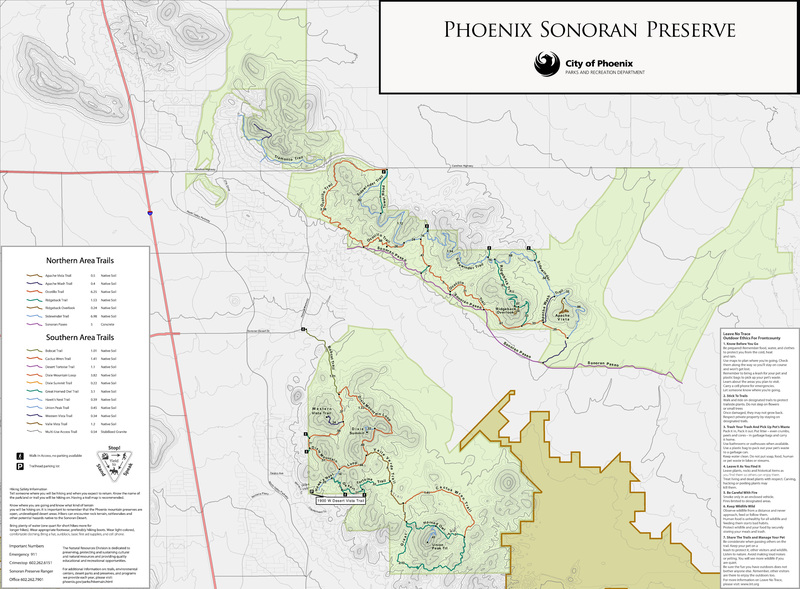 This trail gets very little foot or mountain bike traffic compared with the other portions of the Sonoran Preserve Trail complex. You will be reminded that you aren't far from civilization with the highway noise. And a flight school from the Deer Valley airport often uses the area for helicopter training.